Custom bathroom with a full sized real granite shower. The shower door is an old bus window and the sink is an old volkswagen fender. The faucet is a gas pump from the 1950's but it was new in the box and has never had fuel through it. 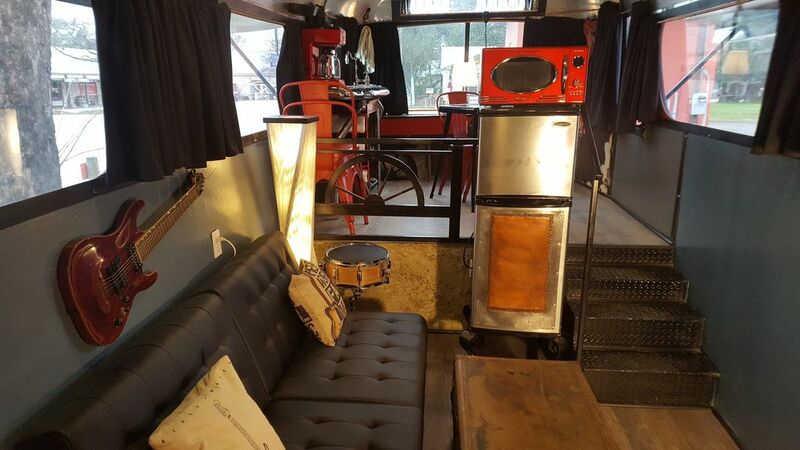 The dining area has a bar table that will seat 4. there is a custom sink/food prep area that is a repurposed 65 mustang bumper with Harley tailpipes for legs. The faucet is top of the line ! The Highwaymen is incredible! We loved it, and Darrin has done an amazing job with it! The bus is really amazing! It is equipped with everything we needed, and loved all the special touches! We enjoyed the fire pit in the evenings and it’s great location in town! Located on the Ingram Loop, with cute shops, great breakfast at Hunters House and a short walk to the Guadalupe River! We made several day trips to Fredericksburg, San Antonio and Bandera during our stay! We will definitely be back! Darren is the best host ever! He really goes above and beyond. The rv was just so freaking cool very creative and fun. Temper pedic bed WOW!!! Check out the rest of all his rentals on site!!! !